Select one of the properties listed below. The exclusive CertifiKID discount code will auto populate in the PROMO code box. You MUST make your reservation through this link to get the CertifiKID rates. Enter your travel dates to confirm availability. If the dates are not available, try other dates or a different property as there are lots of choices. The EXCLUSIVE CertifiKID PROMO CODE will automatically populate in the promo box. Select your room type and click BOOK NOW. Oceanaire Resort - This luxury, premier resort hotel is an 18-story gem among luxury resorts in Virginia Beach, filled with contemporary accommodations and upscale amenities. Enjoy four oceanfront pools - two indoor and two outdoor - plush bedding with triple sheeting, jetted tubs, high end kitchens with stainless steel appliances and granite counter tops, an ocean view fitness center and valet parking. 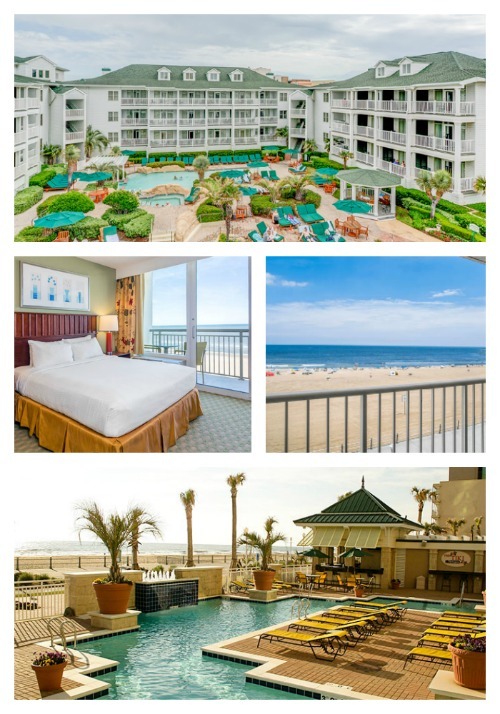 Ocean Beach Club Resort - This stylish oceanfront hotel VA beach towers over the north end of the iconic Virginia Beach Boardwalk. Graced with calming Caribbean design touches and a relaxed aura, Ocean Beach Club stands out among other hotels in Virginia Beach by offering the elegant extras you’d expect at a four-star resort. Boardwalk Resort and Villas - This recently renovated is centrally located in the center of Virginia Beach’s famous boardwalk – named one of the “Top Ten Boardwalks in America.” Enjoy all the amenities you need, including an ocean view fitness center, a heated indoor oceanfront pool and hot tub, laundry facilities and a private parking garage. Turtle Cay Resort - This Key West-inspired resort in the heart of Virginia Beach was recently renovated and updated with granite counters, stainless steel appliances, and sleek cabinets. The sprawling accommodations, inviting common area and family-friendly courtyard offer space to kick back and relax in a convenient location on Atlantic Avenue! Beach Quarters Resort Hotel - With all oceanfront suites, taking in breathtaking ocean views and an array of in-room amenities, Beach Quarters offers the best value on the boardwalk!